Am J Hum Genet. 1999 Oct;65(4):1096-103. Brzustowicz LM, Honer WG, Chow EW, Little D, Hogan J, Hodgkinson K, Bassett AS. Over the past 4 years, a number of investigators have reported findings suggestive of linkage to schizophrenia, with markers on chromosomes 13q32 and 8p21, with one recent study by Blouin et al. reporting significant linkage to these regions. As part of an ongoing genome scan, we evaluated microsatellite markers spanning chromosomes 8 and 13, for linkage to schizophrenia, in 21 extended Canadian families. Families were analyzed under autosomal dominant and recessive models, with broad and narrow definitions of schizophrenia. All models produced positive LOD scores with markers on 13q, with higher scores under the recessive models. The maximum three-point LOD scores were obtained under the recessive-broad model: 3.92 at recombination fraction (theta).1 with D13S793, under homogeneity, and 4.42 with alpha=.65 and straight theta=0 with D13S793, under heterogeneity. Positive LOD scores were also obtained, under all models, for markers on 8p. Although a maximum two-point LOD score of 3.49 was obtained under the dominant-narrow model with D8S136 at straight theta=0.1, multipoint analysis with closely flanking markers reduced the maximum LOD score in this region to 2. 13. These results provide independent significant evidence of linkage of a schizophrenia-susceptibility locus to markers on 13q32 and support the presence of a second susceptibility locus on 8p21. Suggestive evidence for linkage of schizophrenia to markers on chromosome 13 in Caucasian but not Oriental populations. Lin MW, Sham P, Hwu HG, Collier D, Murray R, Powell JF. Previously we reported suggestive evidence for linkage of schizophrenia to markers on chromosome 13q14.1-q32. We have now studied an additional independent sample of 44 pedigrees consisting of 34 Taiwanese, 9 English and 1 Welsh family in an attempt to replicate this finding. Narrow and broad models based on Research Diagnostic Criteria or the Diagnostic and Statistical Manual of Mental Disorders, third edition, revised, were used to define the schizophrenia phenotype. Under a dominant genetic model, two-point lod scores obtained for most of the markers were negative except that marker D13S122 gave a total lod score of 1.06 (theta = 0.2, broad model). As combining pedigrees from different ethnic origins may be inappropriate, we combined this replication sample and our original sample, and then divided the total sample into Caucasian (English and Welsh pedigrees) and Oriental (Taiwanese and Japanese pedigrees) groups. The Caucasian pedigrees produced maximized admixture two-point lod scores (A-lod) of 1.41 for the marker D13S119 (theta = 0.2, alpha = 1.0) and 1.54 for D13S128 (theta = 0, alpha = 0.3) with nearby markers also producing positive A-lod scores. When five-point model-free linkage analysis was applied to the Caucasian sample, a maximum lod score of 2.58 was obtained around the markers D13S122 and D13S128, which are located on chromosome 13q32. The linkage results for the Oriental group were less positive than the Caucasian group. Our results again suggest that there is a potential susceptibility locus for schizophrenia on chromosome 13q14.1-q32, especially in the Caucasian population. Psychotic mice that flee other mice may offer insights into diseases such as schizophrenia, U.S. researchers say. The team at University of Texas Southwestern Medical Center and the Cincinnati Children's Hospital Medical Center published their research in the current issue of the journal Proceedings of the National Academy of Sciences. 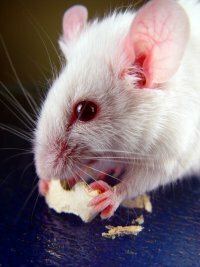 The genetically engineered mice have mutations in two key genes that make them suffer from psychosis, a condition where there is an altered sense of reality. Humans suffering from psychosis, for example, may have hallucinations, have paranoid or delusional thoughts, or may exhibit changes of behaviour. Psychosis is one symptom of shizophrenia, a condition that usually shows up in early adulthood that affects a person's ability to manage emotions, interact with others and think clearly. The researchers looked at mutations in mice that were the same as those found in a Canadian family with a history of schizophrenia, and involve two poorly understood genes. "These mice display certain deficits that are potentially consistent with schizophrenia," said Dr Steven McKnight, chairman of biochemistry at the University of Texas Southwestern Medical Center and leader of the study. "It's too early to tell whether the abnormal behaviour we observed in these mutated mice can be directly connected with human disease." The genes under study were NPAS1 and NPAS3. The researchers mated mice that were genetically engineered to lack copies of the gene and watched their offspring's behaviour. Those that lacked a working copy of NPAS3 were especially erratic, the researchers reported. Normally, caged mice climb over and sniff one another, but the mice with the genetic mutations didn't socialise. One small group of the mutant mice darted around wildly, avoiding their siblings. Normally, NPAS genes are expressed, or active, in brain cells called inhibitory interneurons. They control transcription factors, which are proteins that can activate or deactivate other genes. Just which genes they may control is unclear, McKnight said. McKnight's team said when they examined the brains of the psychotic mice, they found abnormally low levels of a protein called reelin. Reelin is important in the embryonic development of the brain and later in life to brain cell signaling. Other studies of people who died with schizophrenia have found reduced levels of reelin in their brains.